Mr. Angel Gurría, Secretary-General of the OECD, was in Dublin on 15 September 2015 to present the 2015 OECD Economic Survey of Ireland alongside Mr. Michael Noonan, Minister of Finance. The Secretary-General also delivered a lecture at Iveagh House (Irish Foreign Ministry), “Shifting gear: policy challenges for the next 50 years”, as part of the Iveagh House Lecture Series by Senior International Figures. While in Dublin, Mr. Angel Gurría held bilateral meetings with Mr. Enda Kenny, Taoiseach (Prime Minister) as well as several Ministers, and the heads of the Irish Employers Organisation (IBEC) and the Irish Congress of Trade Unions (ICTU). The Secretary-General also visited Trinity College Dublin, where he signed a Corporate Internship Programme. 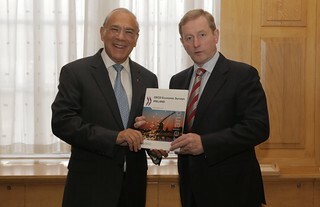 15 September 2015 - OECD Secretary-General Angel Gurría and Taoiseach Enda Kenny. Dublin, Ireland.